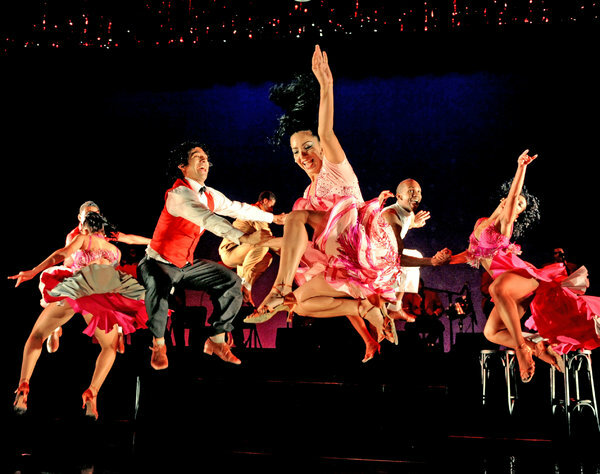 City Center begins its three-week festival of Spanish and Latin American dance, A Bailar, with “Havana Rakatan,” a lively, rhythmically rich production that condenses 500 years of Cuban musical history into two hours. The show was bound for New York before the United States and Cuba renewed diplomatic ties, but that news should only bolster its feel-good spirit, as embodied by the exceptional dancers of Ballet Rakatan and the live music of the Cuban son band Turquino. Before Wednesday’s performance, a panel of Cuban and Cuban-American artists — including Eduardo Vilaro, the artistic director of Ballet Hispanico — will discuss the countries’ shifting political and cultural relations. Tango and flamenco are also on the festival lineup, with Sidi Larbi Cherkaoui’s “Milonga,” a conversation between Argentine and contemporary dance forms (Feb. 26 through March 1), and the popular Spanish troupe Ballet Flamenco Sara Baras (March 4 through 7). A version of this article appears in print on February 15, 2015, on page AR4 of the New York edition with the headline: Dance: A Timely Bit of Cuban History.